I am frequently asked about the placement of leg lines on a lion cut. Is there a right or wrong place to put them? What about blending – should it be done or not? And how do you get all four leg lines straight and symmetrical? When I first developed the National Cat Groomers Institute certification program back in 2007, I had to decide on very specific things like placement of lines on a belly shave, sanitary clip, lion cut and more. There had to be a reason to go with each of those specific line placements. The question is not whether the line placement is right or wrong. Instead it is about what is easiest to achieve while still maintaining esthetics and serving the purpose that was intended by the groom style in the first place. SPEED. When working with cats, time is of the essence. SIMPLICITY. When working with cats, simplicity is best. SYMMETRY. A quality groom will be pleasing to the eye. To achieve all three of the above, it helps tremendously to have a point of reference to work with. The closer the point of reference is, the easier it is to be consistent, and in this case, end up with straight, symmetrical lines. When completed, reverse-shaved finish (with a #10 blade) should meet up to unclipped hair just below the elbow. This creates a very crisp, defined line. Check to be sure both foreleg lines are symmetrical. If both front and back of the elbow serve as the reference point, and the method of “back, front, sides” is used, symmetry is usually quite easy to achieve. Working a mere ½” from the reference point makes it faster and easier to stay on track, especially when dealing with a particularly wiggly cat. For the rear legs, set the line just above the ankle. Going below the ankle makes it difficult to get a straight line because of the contours of the ankle and heel. Placing the line just inside the “dip” above the ankle makes it very easy to get both sides even and straight. Again, reverse-shaved finish should meet unclipped hair at a very distinct line. Stopping the clipper blade just before it would make the turn to follow the contour of the heel/ankle is key here. Once that turn is made, the line is set lower and the whole process of getting both rear leg lines straight, even, and symmetrical becomes something of a challenge. It will definitely require more time. Remember that time is of the essence when working with cats. If the grooming process takes too long, it can mean the groom doesn’t get finished in order to avoid unsavory results for both groomer and cat. There is no need to do any blending at the leg lines. Doing so will make it look cut and will add a lot more time to the groom. Adding more time can lead to disastrous results and a serious cut in pay (since we are paid for our time!). Is it wrong to shave further down the leg than what I’ve mentioned here? No, sometimes it has to be done when a cat is severely matted down the legs. While it isn’t wrong to do this on every lion cut, it certainly does add more time and makes things a great deal trickier. Going back to the three goals of speed, simplicity, and symmetry, sticking close to the reference points makes a big difference. Skip the blending altogether as it will save time as well as create a neater finish that matches on all four legs. Save the blended lines for the dogs! 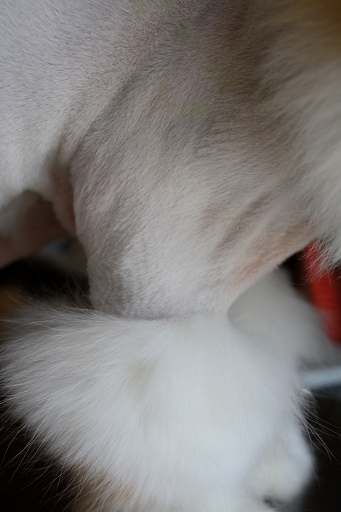 Note: The leg lines on a lion cut are demonstrated on several NCGI DVDs and online courses, including The Lion Cut, Cat Grooming Basics, Get a Grip!, Cat With a Mat, Here Kitty Kitty, and On the Road With Jodi and Danelle. See a ton of cat grooming resources here (both free and paid products). For Lion Cuts: The Lion Cut online course, Here Kitty Kitty DVD & Cat Grooming Basics course. For Matted Lion Cuts: Cat with a Mat DVD, Get a Grip DVD and the Grooming the Aggressive Cat online course. Revamp Your Grooming with the Complete Cat Groomer Training Syllabus to get all of the above resources and much more!